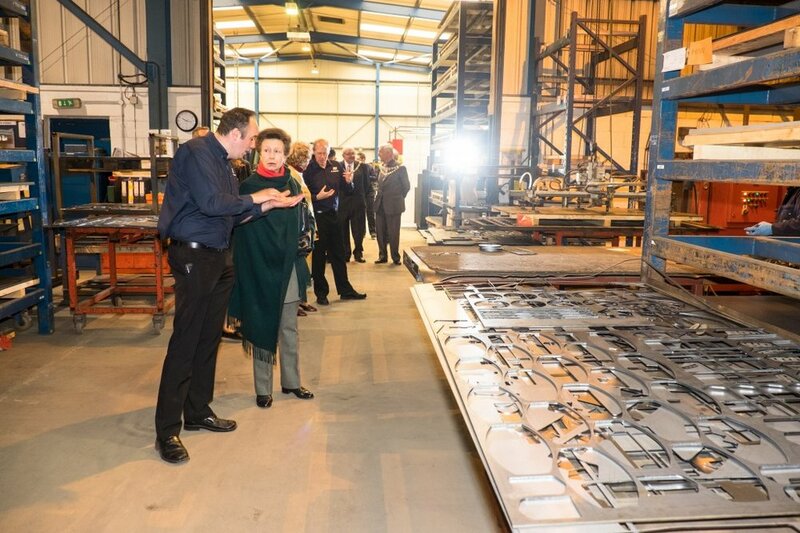 Her Royal Highness, The Princess Royal visited ABT Products Limited in Ross on Wye last week. ABT is the UK’s leading manufacturer of Industrial and Agricultural Equipment Operator Cabs, Vehicle Chassis and Europe’s largest Construction Dumper Rollbar manufacturer. ABT’s customers range from the world’s largest equipment manufacturers to prestigious niche vehicle producers. ABT is also the only UK manufacturer of Truck Mounted Forklifts. The company’s Loadmac Truck Mounted Forklifts are fast becoming recognised as the best in the world. With sales in the UK, US, Canada and in Australia, where they are the country’s best selling Truck Mounted Forklift. 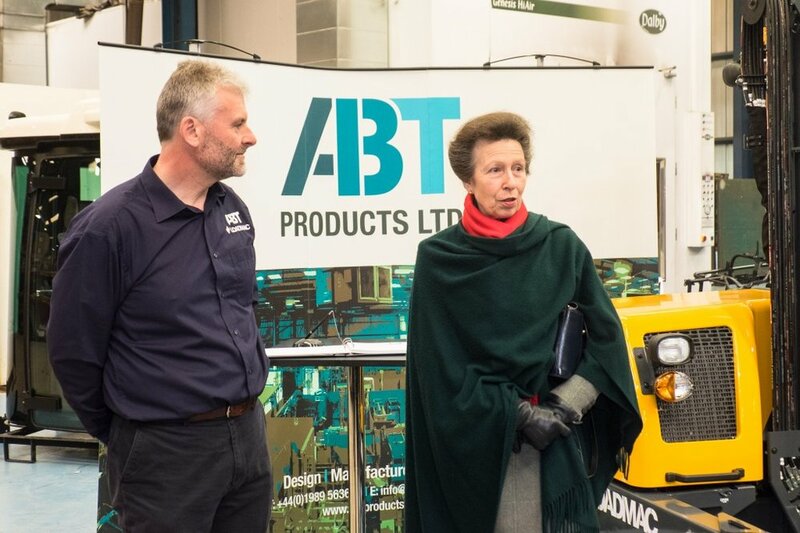 After hearing about the continued growth of ABT and Loadmac, the Princess Royal requested to visit the factory and see the operation for herself. ABT welcomed the visit from HRH, who spent over an hour at the factory located on Ashburton Industrial Estate, Ross on Wye, Herefordshire. Arriving by helicopter, and accompanied by the Lord Lieutenant of Herefordshire, Lady Darnley, the Princess Royal, was welcomed by Cadets, the High Sherriff, Bill Jackson, members of the ABT management team and other dignitaries. These included the Mayor and Mayoress of Ross, Councillor David Ravenscroft and his wife, Doreen. During the visit, Mark Hignett, Managing Director, invited Her Royal Highness to tour the factory, to meet key employees and take a look at their newest Loadmac Truck Mounted Forklift, the 220. Her Royal Highness experienced the company’s full range of manufacturing facilities, from sheet steel laser cutting and folding, tube manipulation, welding, surface finishing and assembly lines. Tim Morris, Operations Director accompanied The Princess Royal throughout the visit, introducing her to 36 members of the 90 strong workforce. Speaking after the event, Tim Morris said “I am proud of what we do at ABT, and the people that make sure that we deliver quality machines on time for our customers. We considered it an honour to welcome The Princess Royal to ABT and demonstrate our design and production capabilities. She was particularly interested in our apprenticeship program and graduate scheme, which has really started to bear fruit in the last year, training highly skilled welders and design engineers. It was satisfying to achieve recognition for the investment the Company has made in training”. Mark Hignett added “Our Loadmac Truck Mounted Forklifts are a prime example of how ABT continues to evolve and ensure that the company remains profitable and employment for our workforce is secure well in to the future. Finding skilled and reliable production operators and managers is the biggest challenge the Company faces if we are to become a global market leader with Loadmac. It is worth mentioning that ABT is one of the founders of the new Hereford University which will help provide the engineers that we need in the future”. ABT employs 90 to 100 people, and was one of the Top 50 UK businesses in the London Stock Exchange “Best 1000 UK SME Companies” report 2015.